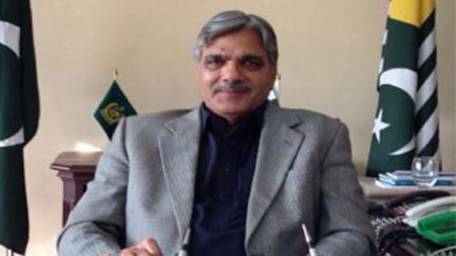 and Gilgit Baltistan Chaudhry Barjees Tahir on Wednesday expressed the optimism that Pakistan Muslim League-(N) will win election with two thirds majority in Azad Kashmir and celebrate “the day of victory” after the result announcement. are held in the presence of army in order to ensure transparency of the elections. personnel and police will perform duty on election day. can think about rigging in the elections,” he added. Programme, the federal government had given Rs 13 billion to the AJK government. While, it would spend Rs 10 billion annually for the development of AJK, he added. for Mirpur and Muzaffarabad medical colleges. He said many mega development projects including construction of motorway and railway links had been announced by the PML-N government in AJK in its manifesto. He said Prime Minister Muhammad Nawaz Sharif wanted equal and non-discriminatory progress in the country. less in revenue in last five years and the government is running its affairs on an overdraft. destiny of Azad Kashmir as the party had planned to undertake massive development projects in the region. government to function and when a no-confidence motion was brought against the AJK premier, the top PML-N leadership advised its AJK leaders to distance themselves from the motion. AJK government for development but not a single development project had been started by the PPP government in the valley. building for the AJK Parliament. should be made keeping in view the present scenario. elections and had deployed administration of his own choice.